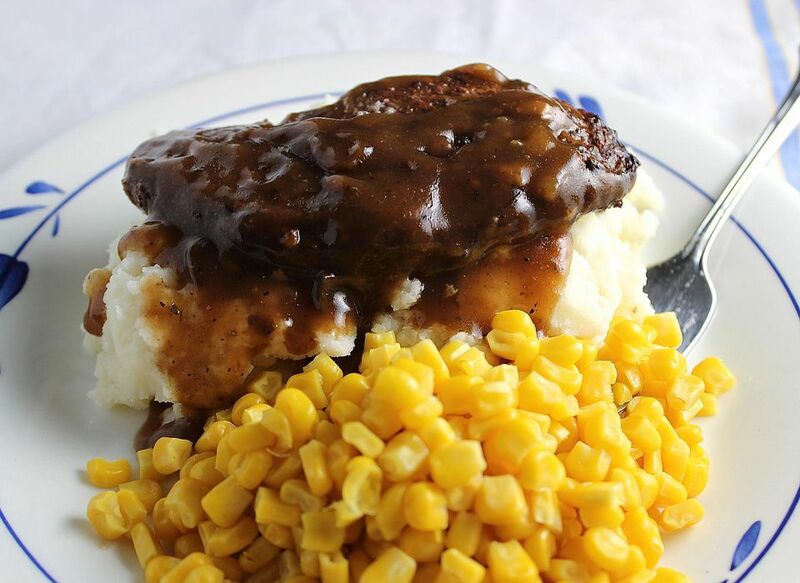 Stovetop Salisbury Steak is so delicious and easy. Tender ground beef 'steaks' are simmered in an onion and mushroom sauce in this classic recipe. Salisbury steaks are sometimes made of round steak, cut into serving size pieces and pounded until tender. The meat is then coated in seasoned flour, browned, and simmered for hours. This is a faster version made of ground beef. It's kind of like meatloaf, but is more strongly flavored, and is served in portions shaped like individual steaks. Serve this recipe on mashed potatoes to soak up the wonderful sauce. You can also serve it on pasta or even polenta, but mashed potatoes are the classic accompaniment and my favorite. This recipe is the ultimate in comfort food. I love to serve this recipe with a simple side dish of buttered corn, and I always add a green salad to the menu for the flavor, temperature, and textural contrast. Toss the salad greens with sliced avocados and cherry tomatoes, and top with an Italian dressing. For dessert, brownies would be wonderful. For a kicked-up version of this recipe, see Spicy Salisbury Steak. In a medium bowl, combine the egg, cracker crumbs, 2 tablespoons milk, onion soup mix, marjoram, salt, and pepper and mix well. Add the ground beef and mix gently with your hands to combine. Form the beef mixture into 4 round or oval patties. Melt the butter in a large skillet over medium heat. Add the onion and garlic; cook and stir until tender and slightly browned, about 6 to 7 minutes. Remove the onion and garlic from the skillet. Add the ground beef 'steaks' to the skillet and cook on the first side until they can be moved, about 4-5 minutes. Carefully flip and brown the meat for 2 to 3 minutes on the second side. Remove the patties from the skillet. Return the onions and garlic to the pan along with the undrained mushrooms, broth, soup, milk, and Worcestershire sauce. Stir well to combine and bring to a simmer. Then carefully return the 'steaks' to the skillet. Simmer, uncovered, for 8 to 10 minutes until meat is thoroughly cooked to 160°F. Serve over hot cooked rice, mashed potatoes, or cooked noodles.